Our RUBY self Check™ unit is ergonomic and environmentally friendly . Designed and manufactured with a low carbon footprint the unit is also styled to meet ergonomic guidelines. 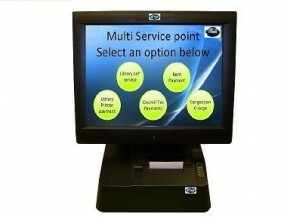 Its modular design allows for easy add on options such as chip and pin and special care has been taken to make this unit easy and accessible for library staff to maintain and manage. A straightforward budget system designed to be a modular fit with your own furniture design. Popular with schools and colleges and in healthcare environments, RUBY SelfCheck™ simply sits on your counter or desktop. No compromise on performance, integration or functionality and as with all our products comes with our support service .